Robin Sutherland - Sutherland & Co.
Robin registered as an architect in 2005 and established Sutherland & Co in 2011, having previously worked as an associate with Edinburgh based Graeme Massie Architects (2008-2011) and Reiach and Hall Architects (2003-2008). 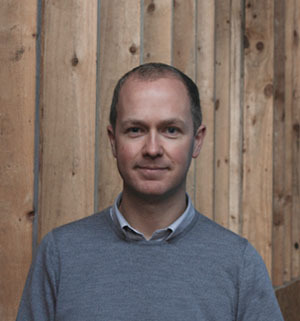 At Graeme Massie Architects, Robin was responsible for delivering the practice’s work in Iceland, including the deiliskipulag (an urban plan and public realm strategy) for the town centre of Akureyri in the country’s north and major urban plans for the redevelopment of Reykjavik’s Old Harbour and Vatnsmyri, site of the city’s domestic airport. While with Reiach and Hall Architects, Robin was project architect for the University of Glasgow’s Beatson Institute (winner of the Scottish Design Awards Grand Prix, GIA Supreme Award, RIBA Award, Civic Trust Award and shortlisted for the Best Building in Scotland Award) and for an unrealised Maggie’s Centre in North Lanarkshire. This project was subsequently resurrected on a new site and went on to be shortlisted for the 2015 Stirling Prize. Robin began his career with LDN Architects, where he was involved in several theatre and museum projects, and interned with a landscape architecture practice in the USA. Robin studied architecture at the University of Dundee, Edinburgh College of Art and at the Royal Danish Academy of Fine Arts in Copenhagen. He has taught in the architecture studios of the University of Edinburgh and University of Dundee.